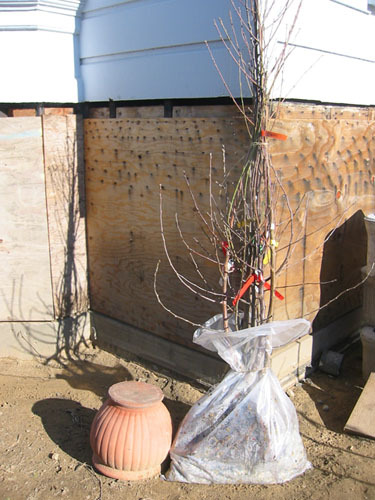 This week the apples, peaches, and nectarines arrived from Trees of Antiquity. 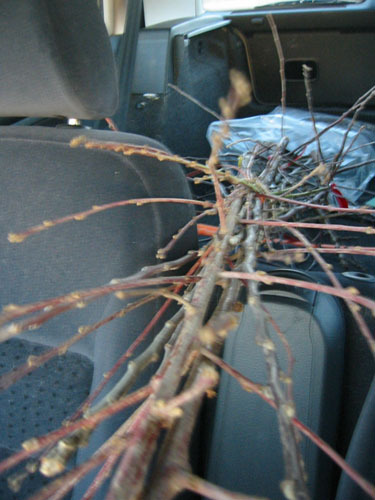 I picked them up in Templeton on the way home, and this afternoon we dragged our butts out to the yard to plant them. Here they are in the car. It's really remarkable how well eight trees can fit into a compact car. I leaned them against the house while I started digging the first hole. 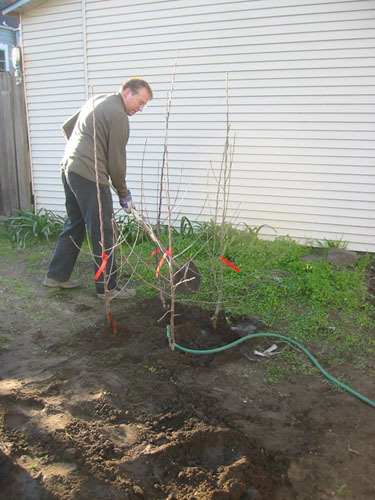 The big snag of the day was this: I dug out the hole for the apple trees and hit a pipe. 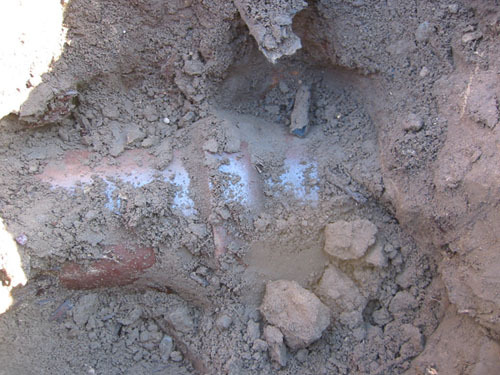 A HUGE pipe: this is about 12" diameter clay pipe. I cleared around it and then sort of stood there staring. 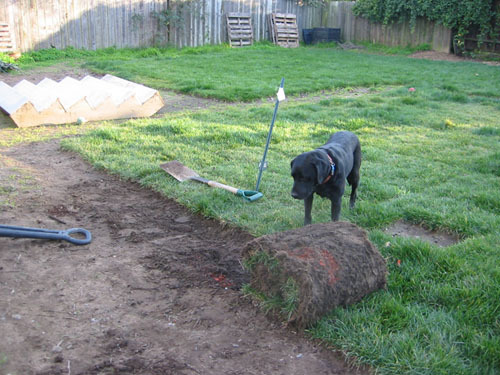 There is nothing anything near this pipe that would require that size pipe for drainage. The nearest building is our neighbor's cottage. Looking from the hole to the back of the lot. Behind us is a parking lot belonging to a laundromat. 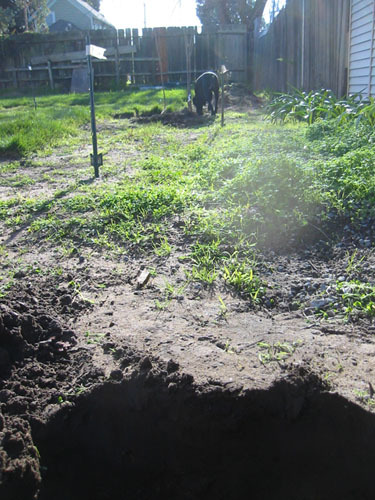 Also, I dug over there to plant the cherries and didn't hit any huge pipe. Where the heck does this thing go? And why is it there? So we made a change in the plans. I swapped the apples with a quince, which could easily be planted over a sewer pipe and not harm it or suffer any damages, should this thing turn out to be too large to remove. 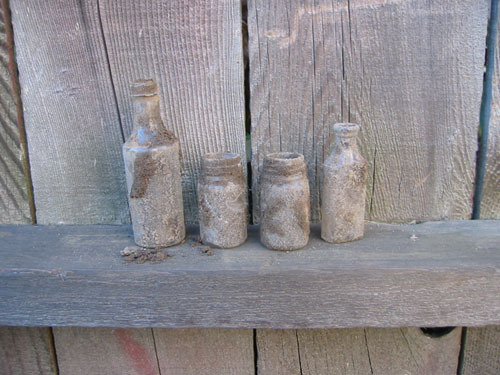 It was another day of finding stuff in the yard, again, because when Noel began digging out the new hole for the apple trees, we hit yet another buried trash pit full of broken china, broken glass, and bits of metal. There were even some whole bottles in there. You know, all this history is really getting to me. One of these days I'd like to dig a hole to plant a tree or bury a pet and not find some mysterious disused utility or Victorian trash heap in that spot. 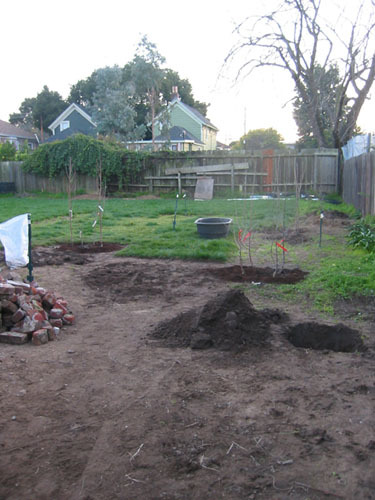 Anyway, we got the apples planted in the new hole without hitting that mysterious pipe again. There was a real difference in size between the peaches and nectarines. The peaches are the tiny ones. Actually, last weekend Trees of Antiquity called me because the Peregrine peach I wanted to plant was not available, so they substituted a peach called Strawberry Free, which is a pink-fleshed peach (the "free" means it's a freestone peach, so the flesh doesn't cling to the pit; the other option is "cling"). I know nothing about it, so we'll see how that works out. 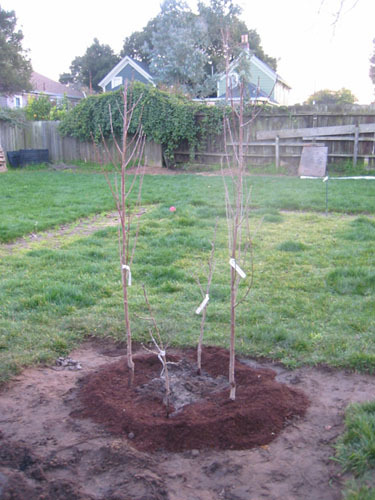 We now have quite the orchard coming together in the back. Alas, I can only sit and wonder when my quinces will get here. The perils of mail order, I guess.